The QuadBoss Aluminum Bi-Fold and XL Aluminum Folding Arch Quadlite Ramps are constructed of fully welded, heavy-duty, lightweight material that includes extra-strength hinges and joints built to easily handle up to 1,200 lbs. and 1,500 lbs., respectively; all outfitted with rubber-coated tabs to prevent tailgate damage as well as adjustable security straps to ensure the utmost stability and safety when in use. 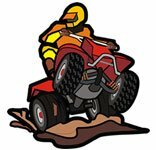 QuadBoss® is a leading brand of quality ATV/UTV parts and accessories. Founded in 2001, QuadBoss has grown to provide a large offering of accessories to make the most of your off-road experience, as well as a variety of replacement parts to keep your quad in top shape. For more information, contact QuadBoss at 877-847-1558 or online at www.quadboss.com. You can also follow QuadBoss on Facebook, Twitter, Instagram and Pinterest. QuadBoss is distributed exclusively by Tucker Rocky Distributing. how would i make a set of wood ramps to get a quad in to the bed of my truck? or what should i do?